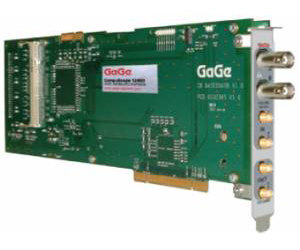 The CompuScope 12400 PCI bus digitizer features 12-bit vertical resolution, 400 MS/s sampling, and high 200 MHz bandwidth. The fast sampling rate enables the capture of high-speed signals with ultra-high timing precision. The high resolution allows the capture of signals with very high dynamic range. Now available with up to 4 GB of on-board memory.